absolutely gorgeous tracks, bit quiet on the highs tho - think the mastering is slightly off so the bass is consuming headspace or smth. Still bit of EQ work and you have a 10/10 record here. 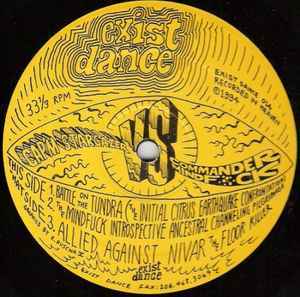 "Allied Against Nivar The Floor Killer"... This is a unique release. I've heard very little like it (White Rainbow's "Pulses" has a similar sound). It's 1/2 "electronic" loops, drones, and drum programming and 1/2 psychedelic rock. They meshed the two sounds into a unifying whole perfectly. The wall of sound is intense. You can feel this song when it peaks. Trippy. This song rocks! 12 years on from the last review, I ended up finding this record in my local charity shop. I heartily agree with the previous written review; it is utter destruction!! Mayhem, complete mayhem. the b-1 track is the trance with a generous head of acid mix quicker, more straight up. The b-2 track is the beginning of YOUR end. flip to the logo side for the complete freak out. Mean, just mean. Rip eye balls out of sockets type mean. One of those record you use as a weapon to destroy the weak.